While I was picking oregano, I spotted this little green tree frog nestling in an old oyster shell on the deck railing. He has since been spotted there (and under the shell, as well) several times. This salad was was made with ingredients that I need to use up. I wanted to make a luncheon salad for the two of us, plus a visitor. In the refrigerator I found small amounts of my favorite homemade balsamic vinaigrette and homemade low-fat vegan mayo left, some leftover lightly-steamed broccoli, a few slices of veggie "bacon", a couple of little mini English cucumbers, 1/2 a red onion and slightly less than 2 cups of home-cooked white beans. I also had a jar of pitted Kalamata olives, which I love. I had fresh golden (miniature) oregano (which was flowering nicely) and chives out on the deck, and a few handfuls of grape tomatoes left. It all sounded like it would make a great, crunchy, colorful new salad, and it did! I'll be making it again, and I hope you'll enjoy it, too. Place all of the salad ingredients (except the Dressing ingredients) in a salad bowl. Whisk together the vinaigrette and the mayonnaise until smooth. Pour the dressing into the bowl of salad ingredients and mix gently but thoroughly. Serve at room temperature or slightly cold. Garnish each serving as desired. Nutrition (per serving): 268 calories, 72 calories from fat, 8.2g total fat, 0mg cholesterol, 692.4mg sodium, 778.5mg potassium, 33.9g carbohydrates, 11.5g fiber, 3.4g sugar, 18.3g protein, 7.8 points. Whisk, shake, or blend the ingredients together well, bottle and store in the refrigerator. Use this simple mixture in place of oil in salad dressing recipes. Unlike plain juice or water, it will help the dressing stick to the greens. This recipe is easily multiplied. NOTE: Other options instead of this mixture-- cooking liquid from cooking chickpeas or white beans (aquafaba). Whisk the broth powder and starch into the cold water in a small saucepan. Cook, stirring constantly, until thickened and clear. Microwave Option: In a microwave-safe pitcher or bowl with room to bubble up (4-cup capacity), whisk the ingredients together. Microwave on High for 1 minute. Whisk and repeat twice, or until the mixture is thickened and clear. Use immediately in a salad dressing, or store in a covered jar and refrigerate. Mama (my granddaughter) and daddy and baby are doing wonderfully well, I'm happy to say, and have lots of family support on all sides. 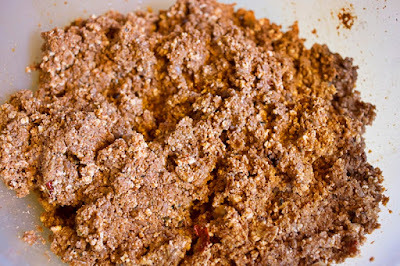 Now that things are settling down, couple of days ago I decided to make some of my homemade vegan chorizo, and I realized that I've never posted the recipe. It's pretty easy to make and you can freeze excess for another meal-- something I do whenever possible. I know that commercial vegan chorizo is available in many places, especially in the USA, but, where I live it's hard to find and expensive when we do find it. I use delicious and spicy Field Roast Chipotle sausages when we can get them, but I don't always have them on hand. My recipe is not gluten-free or soy-free, just so you know. 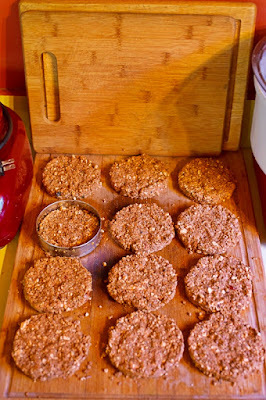 (I developed a Tempeh chorizo for a magazine article, if you would prefer that. See http://www.alive.com/recipe/tempeh-chorizo/) I generally use Yves Veggie "Ground Round" (the plain variety) for this recipe, but other varieties would be fine, I'm sure. Using vegetarian “hamburger crumbles” in the recipe gives this vegan chorizo the "coarse grind” feeling that I remember from eating chorizo in California when I was growing up. 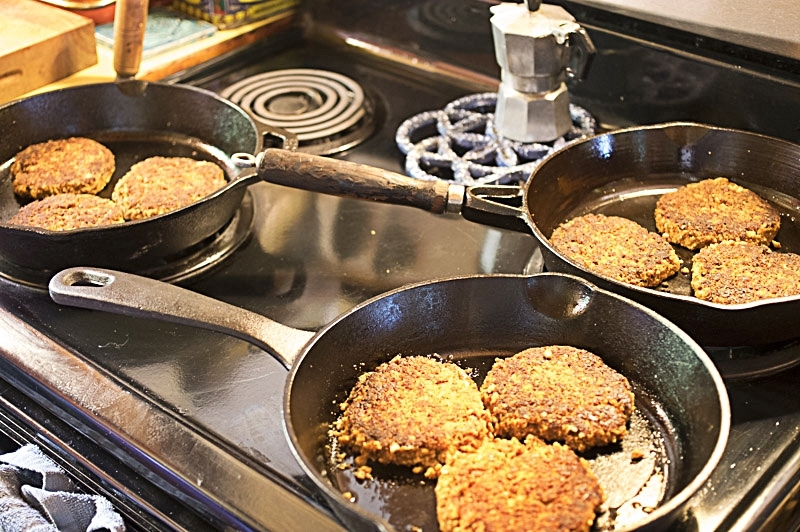 BTW, I chose to form the chorizo into patties rather than "links" because it seems to work better. I made some easy and delicious Potato-Chorizo Tacos with some of the chorizo, which we enjoyed two nights in a row, and froze the rest for another meal. 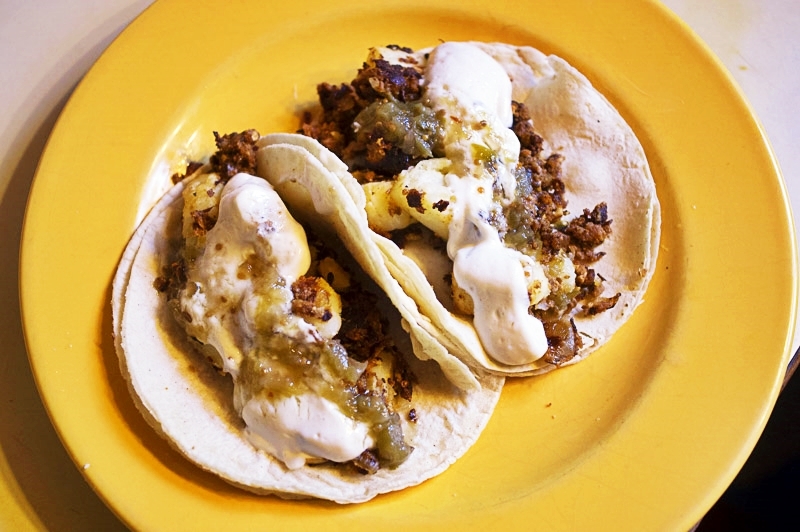 I'll give the general recipe for the tacos below the chorizo recipe, and also how to make a delicious vegan Mexican-style Crema. 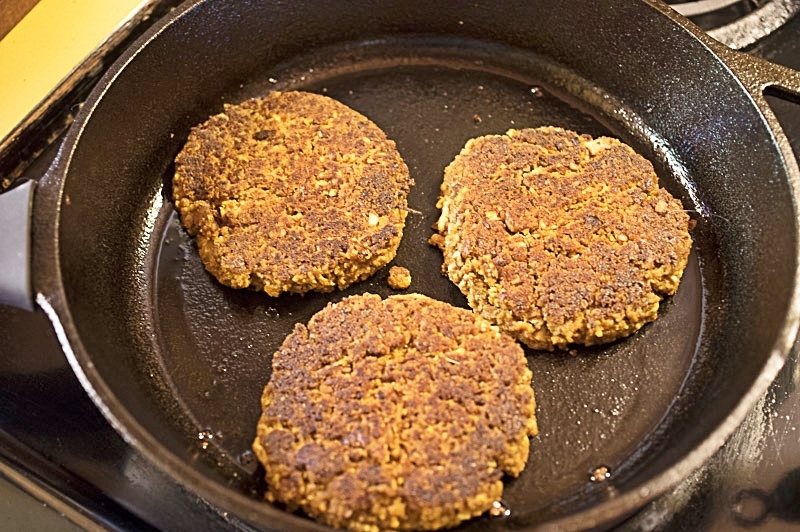 Yield: Makes 14 pattiesGreat with scrambled tofu and many other recipes. 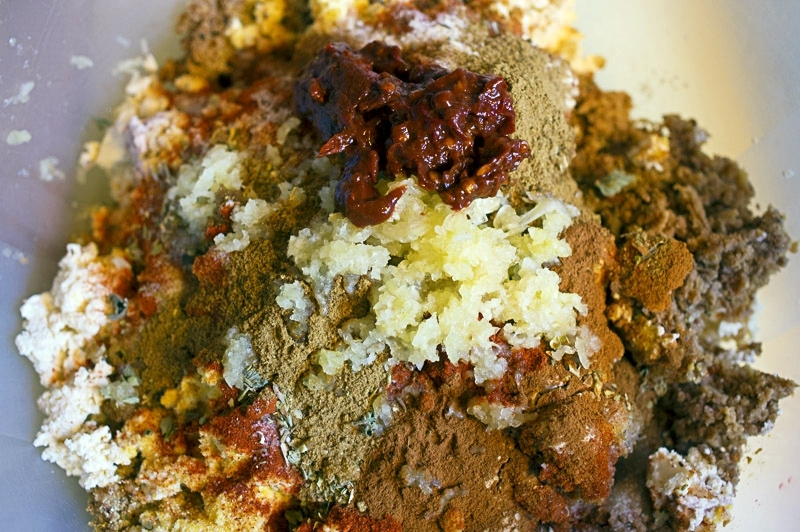 In a large bowl, mix all ingredients together well with your hands. Cook the patties in batches in a covered, preheated large heavy skillet (I prefer well-seasoned cast iron), or pancake griddle (stovetop or electric), or in a roomy electric skillet, over medium heat for about 5 minutes per side. (Don't crowd them.) Carefully (the patties are rather fragile when hot), remove the patties to a platter and refrigerate to firm them up. To store for later use, layer them with cooking parchment in a rigid container and refrigerate for up to one week, or freeze them. To eat immediately (with scrambled tofu, for instance), quickly heat them up over medium heat in a heavy preheated skillet. Break them up with your scramble, if you like, or serve intact, as you would any sausage. Nutrition (per patty): 91 calories, 14 calories from fat, 1.8g total fat, 0mg cholesterol, 655.2mg sodium, 340.6mg potassium, 9.1g carbohydrates, 3.7g fiber, 1.4g sugar, 11.6g protein, 2.7 points. To store canned chipotles in adobo sauce for future use, I freeze each chile with some of the sauce in a section of an ice cube tray. 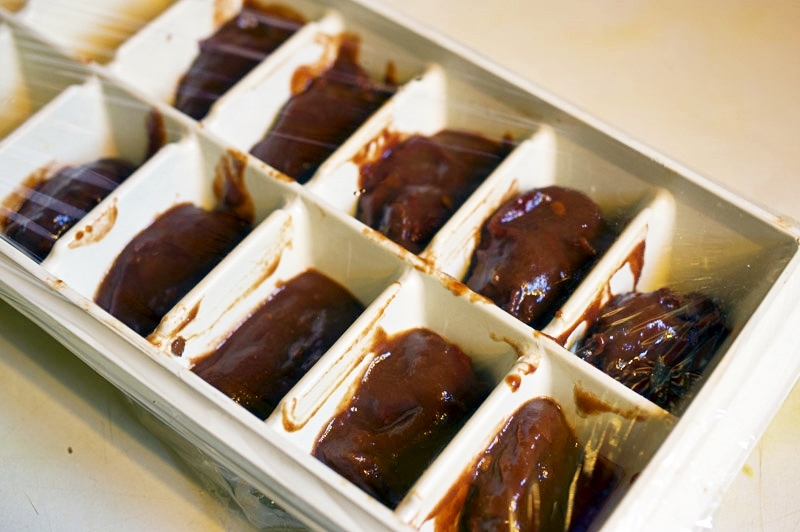 When they are frozen solid, a loosen them and remove them from the ice cube tray and store them in a freezer container or zipper-lock bag in the freezer. Tacos de Papas con Chorizo are common in Mexico and there are many recipes for it. I made a very simple version. I used two soft, warm corn tortillas for each taco. The following made 8 tacos. For the Filling, I sautéed a medium onion, chopped small, in a little dark sesame oil and then added 8 of the cooked Chorizo patties, crumbled coarsely, and a couple of tablespoons of chopped pickled jalapeño peppers from a jar, and kept sautéing for a few minutes. Then I added about 3/4 lb. of diced thin-skinned potatoes which I had briefly microwaved until firm but cooked through. Toppings: I had no avocado or red salsa, and we had a big salad on the side, so I didn't add extra vegetables (such as shredded cabbage). For the only toppings, I used some homemade green salsa that a friend had made from her homegrown tomatillos (I added some of the pickled jalapeño brine to make it a bit spicier) and some homemade vegan Crema. Mexican Crema is runnier than sour cream and not quite as sour. I used half my recipe for Tofu Sour Creme (made with extra-firm silken tofu) with 1/2 cup added soymilk and another 1/2 tsp organic sugar. You could also use my recipe (the whole recipe) for Cashew Sour Creme, if you prefer. I love this Crema-- so rich-tasting and smooth, and not loaded with fat.